Something is wrong here. About that much, at least, there is no doubt. Peter Carey is an award-winning novelist. Born in Australia, the author of "Oscar and Lucinda" now lives in New York City with his 12-year-old son, Charley. Charley, Carey tells us, is shy. But Carey, as we shall see, isn't the most reliable narrator you'll ever meet. Peter Carey's book, "Wrong About Japan: A Father's Journey with His Son," tells you nothing more about Japan, anime and manga than you can learn on the Internet. More to the point, however, Charley is obsessed with anime and manga. That's Japanese animation and comic books, for the uninitiated. So, Carey decides to indulge his son, and the two take a trip to Japan. There, Carey hopes his son will learn something about the culture that produces anime and manga. Meanwhile, Carey plans to run his theories about the deeper meaning he sees in various anime and manga past some Japanese, just to find out if he is onto something. 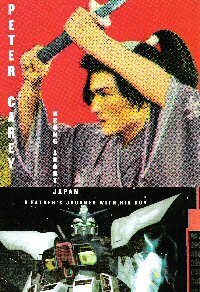 Carey chronicles his and his son's adventure in "Wrong About Japan: A Father's Journey with His Son" (Knopf, $17.95), a rambling, frustrating and unenlightening book that will tell you nothing more about Japan, anime and manga than you can learn on the Internet in a few minutes time. Japan is wasted on Carey. He and his son meet the two greatest living animators in the country, Hayao Miyazaki, director of the Oscar-winning film "Spirited Away," and Yoshiyuki Tomino, creator of the influential giant-robot series "Mobile Suit Gundam." But Charley, as Carey says, is too shy to speak up, and Carey asks Tomino silly questions that elicit responses like, "No, that's not it at all." Carey, for example, is fixated on the idea of robotic armor, like that piloted by the main characters in "Gundam," as a metaphor for separation. The armor cuts its pilot off from the world around him. But, as a "Gundam" fan tells Carey, the exact opposite is true because in "Gundam" the pilots feel the pain of their robots being damaged in battle. Being inside the armor is like being in your mother's womb. You are protected, but you still experience everything your mother experiences. Maybe if Carey had seen the anime "Neon Genesis Evangelion," he would have had an easier time with the robot-as-womb metaphor. But if Carey arrives in Japan with a head full of wrong ideas, he leaves no better off, and some readers of "Wrong About Japan" are likely to fare about as well. The confusion that creeps in is largely because of a fictional character that Carey drops into what we're otherwise supposed to take as a nonfiction narrative. Takashi is a teenager who looks suspiciously like he just stepped out of an anime. His eyes are too big and round, and his hair is too shiny and spiky. He is an anime character made flesh and blood because that is what Carey wants him to be. Once we realize that Takashi is a fiction (Carey never makes the point explicit), how are we to react to him? Where do his thoughts and observations come from? Can we trust him? At only 158 pages, you can read and forget "Wrong About Japan" in a single afternoon, and it goes without saying that there are far better books about the relationship between Japan's pop-culture exports and the society that produces them. Frederik L. Schodt's "Dreamland Japan: Writings on Modern Manga" and "Manga! Manga! The World of Japanese Comics" are ideal places to start. A more recent, if less ambitious, book is Fred Patten's "Watching Anime, Reading Manga: 25 Years of Essays and Reviews." Granted, neither Schodt nor Patten has ever won a prestigious Booker Prize for his books. They simply have the advantage of not being wrong about Japan.